The BlackBerry Z10 was officially unveiled yesterday and it is an all-touch BB10 device and a comeback for BlackBerry. 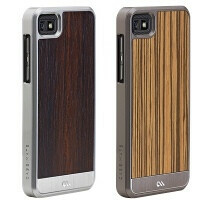 Now, it is getting fine attire as well as Case-Mate has announced it will be making six cases for the Z10. Case-Mate will deliver everything from premium cases like the $80 Crafted Rosewood and Crafted Zebrawood to the $35 Tough Classic and $30 Barely There. You can also get a Refined Brush Aluminum case and a Black Signature Flip, each for $50. You can check out the BlackBerry Z10 cases by Case-Mate right below. This article is messed up in every direction. Only 5 and 6 are BB's... All other cases are iPhone 5's. Very nice casing, I wonder would the Brush Aluminum case effect the signal or the GPS? Either way, I like em. They look classy and fit the business appeal.